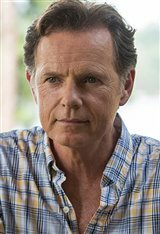 Canadian born Bruce Greenwood spent the first years of his life in Noranda, Quebec before moving to Princeton, New Jersey, then Washington D.C. and finally to Vancouver, British Columbia at age eleven. Bruce trained at the University of British Columbia and the American Academy of Dramatic Arts. After graduating, he landed bit roles in the feature films Bear Island (1980) and First Blood (1982). Before moving to L.A. to pursue an acting career, he spent a year touring as a singer/guitarist with a rock band. In 1984 Greenwood landed his first TV series, the short-lived Legmen in which he played a college student earning extra money by working for a seedy private detective. Although a key role in the TV-Movie Peyton Place: The Next Generation followed, he first came to attention on St. Elsewhere as Dr. Seth Griffin, the brash doctor who finds religion after he contracts AIDS from a hypodermic needle. More TV roles followed, including spots in Spy, Summer Dreams: The Story of the Beach Boys, The Larry Sanders Show and the title role in Nowhere Man. For his impressive guest appearance on Road to Avonlea, Bruce won a Gemini award. In film, Bruce has appeared in such American films as Passenger 57 and Wild Orchid, but his Canadian work has gained him more acclaim and attention. In 1994, he starred in Atom Egoyan's critically-acclaimed Exotica as a tax inspector obsessed with a stripper. He reunited with Egoyan to play the mournful father Billy Ansel in the Oscar-nominated The Sweet Hereafter with Ian Holm and Sarah Polley. This film garnered him a Genie nomination. From focusing his early career in television, Greenwood began to work more intensively in the feature film industry late in the 20th century. Some of his more notable appearances in film includes Fathers Day (1997), Thick as Thieves (1999), The Lost Son (1999), an independent British feature; Disturbing Behavior (1998), Double Jeopardy (1999) playing the treacherous husband, and Rules Of Engagement (2000). He continues to work in features such as Thirteen Days (2000) with Kevin Costner, Eight Below (2006) with Paul Walker and Star Trek (2009), but makes time to return to the small screen in miniseries such as Haven, It's a Girl Thing and The Magnificent Ambersons. More recently, he starred in Good Kill (2015), The People v. O.J. Simpson: American Crime Story (2016), Spectral (2016), Gold (2017) and Mark Felt: The Man Who Brought Down the White House (2017). His latest role is in the Steven Spielberg drama, The Post (2018). Since then, Bruce has been busy on television, with a starring role as Randolph Bell on the Fox medical drama series The Resident (2018). He also provides the voice of Batman/Bruce Wayne to the animated series Young Justice (2010 to 2019). He has been married to Susan Devlin since 1985.